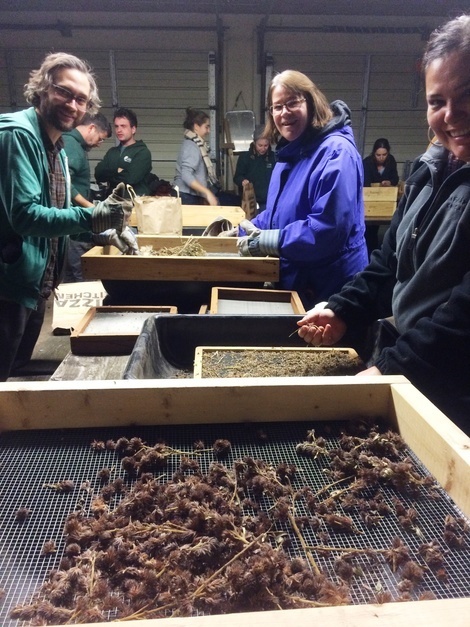 One chilly December evening, a gaggle of good-hearted folks, generous with their time, gathered in a south suburban garage to generate glorious, gleaming seeds, an important step in replenishing the biodiversity of our public lands. 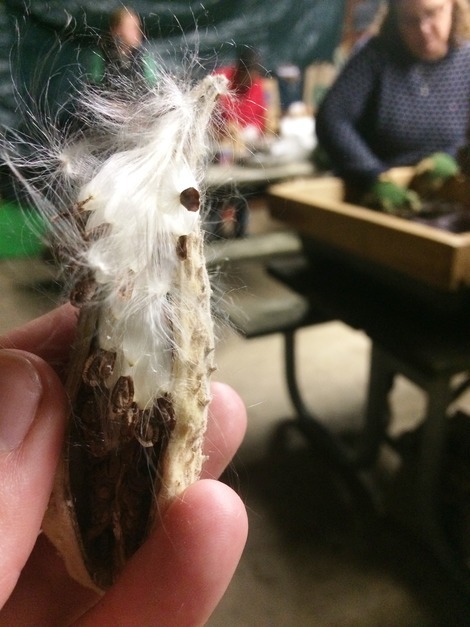 A milkweed pod and the beautiful fluffy material that helps this seed travel! Separating the seed from other organic material, like seed pods or surrounding duff or chaff, ensures a better survival rate for the seed because trapped moisture can cause seeds to rot. Seed cleaning also makes seeds a bit more manageable as they take up less space and gives them a better chance to “take” once re-spread. The 30-member “seed party” included partners from Friends of the Chicago River (including our Volunteer and Events Associate Annette Anderson), the Cook County Forest Preserves, Friends of the Forest preserves, the Field Museum, and the North Branch Restoration Project. Volunteers who collected the seeds in the field were careful to label them with the locations where the seeds were found and type of seed. Forest Preserve policy is to re-spread seeds from where they were harvested or appropriate nearby locations. This approach is based on the belief the seeds will grow better because they evolved under similar environmental conditions. 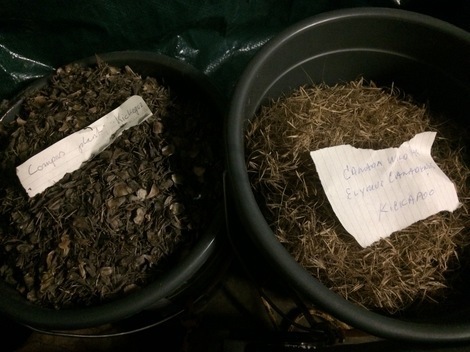 In addition, the use of local seeds is a way to maintain genetic integrity. Re-seeding is an integral part of land restoration following the removal of invasive plant species. Land restoration improves plant and animal habitat. For example, invasive plants can make turtle nesting areas too shady for the reptiles, forcing them to search for sunnier though more vulnerable spots often near high-traffic roads and trails. Land restoration can also help in stormwater management. Native plants absorb rainwater better than invasive species allowing less runoff into sewage systems. Such sewage systems can be overwhelmed during storms causing releases into basements and nearby streams. This meeting of intrepid souls was held in an unassuming place, a garage at the Sand Ridge Nature Center in South Holland. Garages are THE place where the outdoors meets the indoors, where outside people do stuff when they have to be inside. Garages are where outdoor tools are kept inside—our rakes, mowers, blowers, planters, bulbs, barrows, spades, saws, nails, and pails. It’s where we can create the future we want, a place where we can build, repurpose, and do some good old-fashioned hanging out with others who care about protecting and preserving nature. For more information about similar efforts through the Centennial Volunteers group, see http://bit.ly/CentennialVolunteer.